Once a "true" village in its own right, Clayton has now been absorbed into the West Yorkshire conurbation of Bradford . 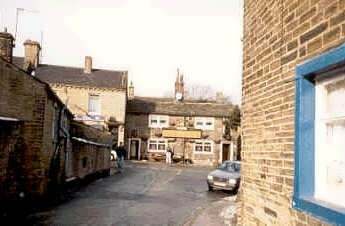 Nevertheless, the area still has a village feel about it, with a main street which includes several traditional pubs (including the Black Bull and the Albion). There are also several shops, churches, and a nearby golf club and reservoir at Clayton Heights with views of the city of Bradford and the village of Thornton across the valley. Although not directly associated with the Brontes, the long distance Bronte Way footpath passes close by, and with Thornton (where the Bronte sisters were born) being within walking distance, Clayton must have been well known to Patrick Bronte when he lived in the area. Indeed his curate, Edward Thwaite, apparanty lived in the village. Perhaps Clayton's greatest claim to fame (or infame) is as the birthplace and home of Albert Pierrepoint, one of the United Kingdom's last state executioners. In his role as hangman Pierrepoint despatched some of the country's most notorious convicted murderers - while paradoxically expressing some personal reservations about the value and use of capital punishment. On a lighter note, the village is known for hosting an annual Dickensian Market - which usually takes place in the run up to Christmas.